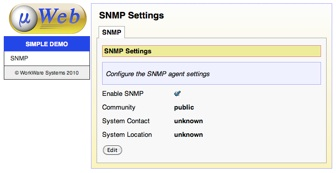 help "Configure the SNMP agent settings"
from the page definition above. μWeb takes a unique approach, combining a declaration-style approach for fields and pages with a built-in scripting language for actions and customisation. On the right is an example of a page which allows SNMP settings to be configured for an embedded device. Click the see more link to see the full page definition. 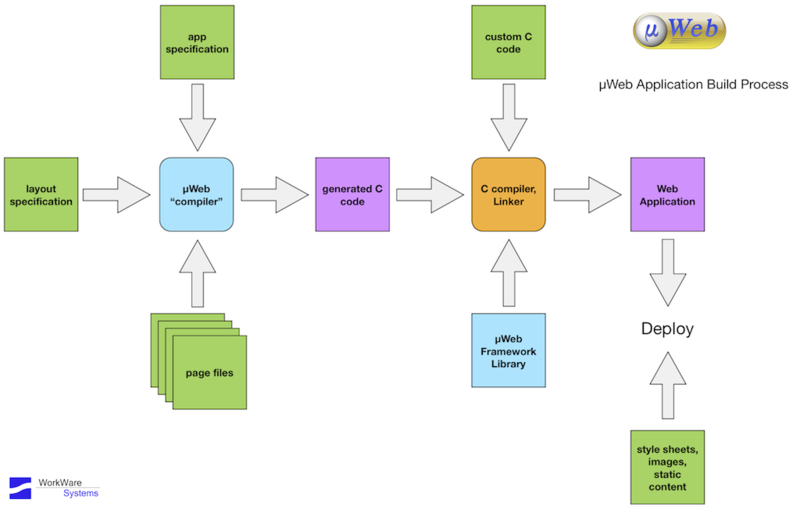 The µWeb compiler combines the page definitions along with the overall application and menus definitions, and links to the µWeb runtime to produce the web application to be deployed to the target device. The resulting web application is easily deployed either standalone, using the built-in web server, under inetd, or as a cgi-bin application running under a separate web server. Static content (style sheets and images) can either be deployed directly to the filesystem or linked into the application with the VFS layer. Just define the elements of your page, add the required behaviour and µWeb will do the rest.